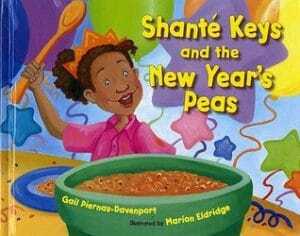 Celebrate the new year and teach your child about new cultures with Shanté Keys and the New Year’s Peas. Written by Gail Piernas-Davenport and illustrated by Marion Eldridge, this fun and engaging tale highlights different New Year celebrations from cultures around the world. From the publisher: Shanté Keys loves New Year’s Day! But while Grandma fixed chitlins, baked ham, greens, and cornbread, she forgot the black-eyed peas! Oh no—it’ll be bad luck without them! So Shanté sets out to borrow some from the neighbors. Does Miss Lee have peas? What about Mr. MacGhee, or Shanté’s good friend Hari? None of them do—but, as Shanté discovers, they have fun foods and traditions for their New Year’s! Now, if only Shanté can find good-luck peas in time for dinner! Don’t wait! Pick up a copy of Shanté Keys and the New Year’s Peas for your little reader at your local library.